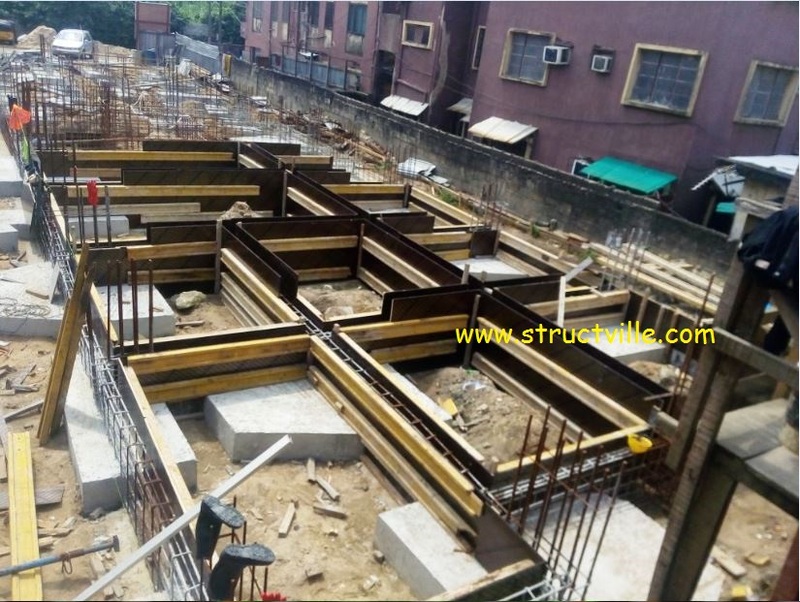 In the design of beam and raft foundation, ground beams receive ground floor/raft slab pressure loads. These loads could be from earth pressure reaction or occupancy loads/dead loads. In this case, a raft foundation supported on ground beams is used to overcome low bearing capacity of soil. This is the cheapest alternative for constructing foundations on weak soils carrying low superstructure load. The advantages of this method come with the fact that the volume of excavation to be done is reduced to minimum (you excavate for the ground beams only), while the slab performs the dual function of raft slab/building DPC. This usually demands for deep beam sections in order to raise the height of the ground floor above natural ground level. This type of foundation can be designed using finite element analysis, or can be designed manually using rigid theory. In the rigid theory, the disposition of the foundation has to be right in order to assume full rigidity, and we assume that the stiffness of the raft slab covers the weak patches of the soil adequately. What this means is that the settlement of the soil will even out under the rigid footing, with high internal forces developing in the slab. If a flexible approach were to be used, there would be differential settlement, but lower stresses on the elements, thereby leading to more economical design. Note that rigidity criteria is a function of superstructure stiffness and soil stiffness. Different codes of practice have their own definition of rigidity. In the rigid method, usually the soil pressure on the slab is evaluated, and transferred to the beams by assuming a sort of combined footing approach. In this approach, the ground floor slabs are supported directly by ground beams, which in turn are supported by pile caps. In this case, the slabs are designed as suspended slabs, and ground pressure reactions are not taken into account. Let us assume that in the example above, we will be introducing ground beams (1200mm x 225mm) along the column axes , and having the slab thickness as 200 mm. Note that the thickness of the slab and the occupancy load will be advantageous in this case, and may have to be neglected. From the analysis, the maximum pressure on the raft slab was discovered to be 49.975 kN/m2. Note that with the introduction of the ground beams, the 1000 mm projection is no longer necessary. 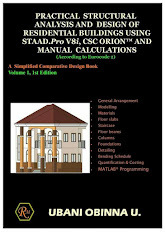 So a simplified way of analysing and designing the ground beams using Staad Pro is as follows. Step 1: Model the ground beam as appropriate and support with pinned support at the column points. Also assign the properties of the beam (1200 mm x 225 mm). Remember that the load is assigned a positive value because it is an upward pressure. Step 3: Run the analysis to obtain the bending moment given below. Let us consider the beam along grid line B. Result from Staad Pro software indicate that the maximum span moment is 463 kNm. So with this information at hand, you can provide your reinforcements at ULS depending on the code of practice you are using. Note that where applicable, you might need to consider wall loads, self weight, etc, but note that these gravity forces will be likely beneficial, because they will reduce the resultant load on the beam due to earth pressure. This is just a simple and straightforward approach that would always yield conservative results. Thanks for this publication.this is educative. As started above, if the ground beam us assigned 1200mmx225mm, how deeply should this beam be below the natural ground level? It depends on the site, and such things are supposed to be on the construction drawing. Consideration of flooding, groundwater level, etc will determine the height above natural ground level, while geotechnical parameters will likely influence depth below ground level. • Congratulations for this wonderful blog. I found it very informative and interesting too. I have bookmarked your blog and will return in the future. I want to encourage you to continue that marvelous work, have a great daytime!